The Vancouver Canucks announced on Monday that they have signed defensemen Yann Sauve, Lee Sweatt, and Chris Tanev. The terms of the deals were not revealed. Yann Sauve was the Canucks second round pick (41st overall) in the 2008 draft. The 20 year old Sauve finished the season with 7 goals, 29 assists and a + 42 in 61 games for the Saint John Sea Dogs of the QMJHL. Lee Sweatt and Chris Tanev were both free agents. Sweatt, a 24 year old from Elburn Illinois, spent time with both Riga Dynamo of the KHL, and TPS Turku in the FNL in Finland. He recorded seven points in 37 games in Riga, and 16 points in 21 games with Turku. Chris Tanev played the 2009-10 season with RIT of the NCAA. The 20 year old notched 10 goals and 18 assists in 41 games. Tanev led all RIT players with a +34. Good depth signings by the Canucks. Sauve and Sweatt will most likely see time with the Moose next season, while Tanev will start out with the Victoria Salmon Kings of the ECHL. Twenty-year-old Sauvé will most likely be ending his junior career with his highest totals in all categories this year. Along with Simon Després (PIT), and youngster Nathan Beaulieu, Sauvé has been an anchor on defense for a fast-skating Sea Dogs team. The Canucks will probably determine that next year he would be better served by beginning his professional career; however, with other defensemen ahead of him on the Canucks depth charts, this will most likely be with the ECHL Victoria Salmon Kings. Obviously, this transition will be contingent on how well he performs at training camp. But that aside, playing against bigger, faster players will help Sauvé to continue developing his decision-making skills with the puck. The Sea Dogs postseason is rolling right along, and Sauvé sits third overall on the team in points by a defenseman with seven. Originally expected to be a two-way defenseman with good size and skating, Sauve’s offensive game has not developed as fast as the rest of his skills. Sauve is a big, mean defender in his own zone who is physically strong and good positionally. However, he tends to get into trouble when he has the puck. His puck-handling skills could use some improvement and his decision making with the puck is generally poor. Right now he is on track to become a one-dimensional defensive d-man. 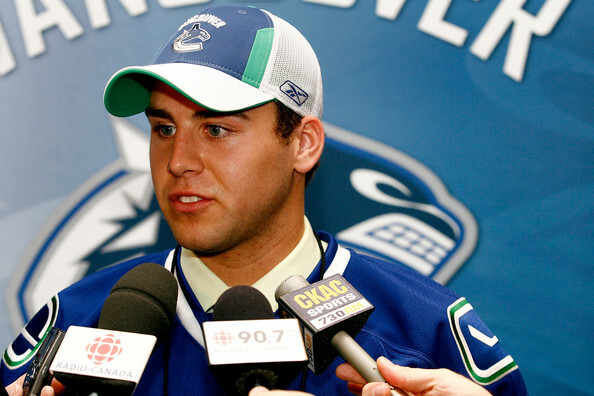 The Canucks hope the other facets of his game can evolve over time. Sauve is a long-term project who will most likely needing further seasoning in the minor pro ranks. Sauve was once more highly touted than he is today and considered to have greater offensive potential. Sauve is on track to be a steady and reliable second pairing defender for the Canucks.